Many believe dehydrating food is the safest, most affordable and best way to preserve flavors of foods. Having a dehydrator available allows you to make fruit leathers , dried fruits, beef jerky , nuts, seeds, and even meals . They cut down on wasted food, save money on pre-packaged snacks, and allow your family to eat healthily on the go. Dried foods are a life-saving staple and one of the most affordable ways to create an emergency food supply or preserve  food that would otherwise go to waste. The Prepper’s Cookbook  hails this culinary tool as a must-have for creating a stocked pantry. If you have thought about buying a dehydrator, chances are you’ve heard of the Excalibur Food Dehydrator . It is the gold standard in food dehydration: it is reviewed highly by users, performs well and has a great guarantee package, and the customer service team has a great reputation. Many feel it is worth the upfront investment , especially if you plan on using your dehydrator often, but for some people, the $250 price tag is too much to bear. That said, you have options! Below are some alternatives to the upper-end models and come highly recommended. 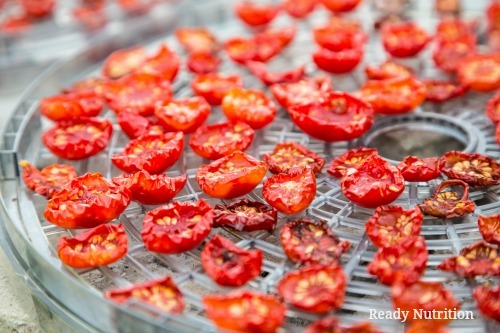 Four budget-friendly food dehydrators that get the job done! This no-frills dehydrator is as affordable as you can get. Selling for under $40, this four-tray system is compact and still powerful enough to dehydrate a good amount of fruits, veggies, jerky, and leathers. The clear cover allows you to keep watch over your snacks and the trays and cover are all dishwasher safe. It is quiet and lightweight, therefore easy to carry into various rooms for different purposes (such as making potpourri or drying herbs from your garden). One drawback is a lack of temperature control, but satisfied users agree that the general setting is sufficient for most tasks. This would make a great purchase or gift for someone new to food dehydration. At around $60, the Nesco Snackmaster Pro is one of the newest dehydrators in the Nesco product line. It has 700 watts of drying power and comes with 5 drying trays (up to 12 trays can be used in the unit but those additional trays need to be purchased separately). The adjustable thermostat ranges from 95-160 degrees. It is lightweight and compact and includes added goodies like 2 fruit roll up sheets, 3 packets of beef jerky spice, and a detailed recipe and instruction book. There isn’t a timer or an on/off switch on this unit, though users seem happy with the other features at this price point. This dehydrator is around $50 and incredibly user-friendly. It comes with 5 trays, each of which has 6 stacking tabs that allow you to change the height between each tray so you can place thicker food on the tray and still get good results. There is space for up to 20 trays in this unit (additional trays sold separately). The trays are clear and dishwasher safe, though some users complain that the base of the unit can be difficult to clean. It is fairly quiet and has an on/off switch; it comes with a detailed user guide. The Cuisinart Food Dehydrator is the priciest in this list, though at $65 it still comes in at a much more affordable rate than the Excalibur. It has a 620-watt motorized fan with a top vent. It can hold 9 trays total and jerky lovers seem to love this dehydrator: it dehydrates up to 4 pounds of meat in 4-5 hours, depending on the cut. Replacement and additional trays are a bit pricey at around $14 a piece; otherwise, the reviews for this product are very satisfactory. In planning for a long-term disaster, people are always trying to find foods they can look forward to that will give them optimum nutrition. These budget-friendly food dehydrators will help you do just that. Happy dehydrating!